Global Poker Index’s Alex Dreyfus has warned us that poker is in danger of becoming "the has-been game of 2000s," unless it is able to innovate and reinvent itself. Poker is no longer the "young man's game" it was six or seven years ago; the average online poker player's age in the regulated US market is now 40. Dreyfus, in a recent op-ed for the Huffington Post, credits new online strategy games like Hearthstone, for robbing poker of its youth. Meanwhile, he has been vocal about the need for the industry to embrace new media and new platforms, such as Twitch and e-sports, as it seeks reinvigoration by appealing once more to a younger demographic. Dreyfus’ own vision for poker is shaped by e-sports, and his new creation, "The Cube" – a portable 20-foot one-way soundproof glass case that beams player hole cards and live data from its top for the benefit of spectators – owes much to the way that e-sports presents itself as spectacle. One such new medium that has the potential to save poker is virtual reality. 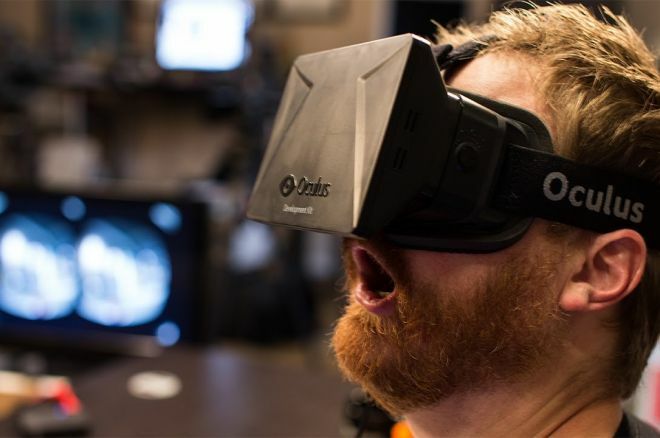 The Oculus Rift virtual reality headset will be commercially available, we hope, sometime in the first quarter 2016. In fact, when the headset hits our stores, early adopters will immediately be able to explore, and gamble in, a virtual casino. SlotsMillion has created the first ever fully functional, real-money, virtual reality online casino. The SlotsMillion virtual space is a casino lobby in the clouds, on the 80th floor of a towering skyscraper set against the backdrop of a futuristic city. Players are free to explore the space, check out the views, interact with one another's "virtual presences" and of course, play the games, which have been rendered in stunning 3D VR. Slots are currently the only games available because they’re simpler to render, but table games, and of course, poker, are also on the cards in the near future. Poker, however, may well prove to be the most appealing of VR casino games because it is also the most social and interactive form of gambling. That means it’s likely to appeal to both social gamers and real-money players, two groups that have traditionally been treated largely as separate demographics by the industry. "Part of the challenge that virtual reality faces is convincing those who have not tried it just how amazing it really is," says Alexandre Tomic, co-founder of SlotsMillion. !While users are immersed in intricately rendered 3D, their senses are completely tricked into believing they are truly there. It’s mind boggling, and so are the possibilities for online poker. !Players will be able to experience 'TV Style' VR final table environments, for example. Meanwhile, their friends and fans will be able to sit in the audience and watch them play, while, in turn, the players will be able to hear them cheering them on." If there has been a disconnect between the TV poker audiences at large and their actual understanding and experience of the live game, then this could bridge that gap. Ultimately virtual reality is about ramping up the levels of engagement, be it a video game or a social game or a 3D movie. The online poker industry has been searching for ways to make the game more engaging to recreational players for some time – more fun – and those factors often cited as scaring off the recs – bots, HUDs, scripting, multi-tabling pros – will have no place in the VR online poker space. In short, the recs will love it. Meanwhile, VR will be revolutionary for poker training, reinventing the interactive relationship pupil and trainer. And we'll be able to scan in famous poker personalities as avatars so that you can play against them and interact with them with much higher fidelity than ever before. This is not some fevered utopian dream. It will begin next year, although it will begin slowly, as limited headsets mean limited liquidity. But the adoption of virtual reality hardware is expected to grow massively from three to five years of its inception, with predictions of a $2.8 billion hardware market by 2020. The good news is that those early adopters will be gamers – the 20-somethings with the high-spec gaming PCs. The very demographic that has deserted us. Virtual reality has the power to a game-changer. Quite literally. And remember, you heard it here first.